..... maybe another "now" project. GREAT pics - well done !! It was actually planned as such - I'll chat with wino to resurrect this idea - exactly as you said PH. 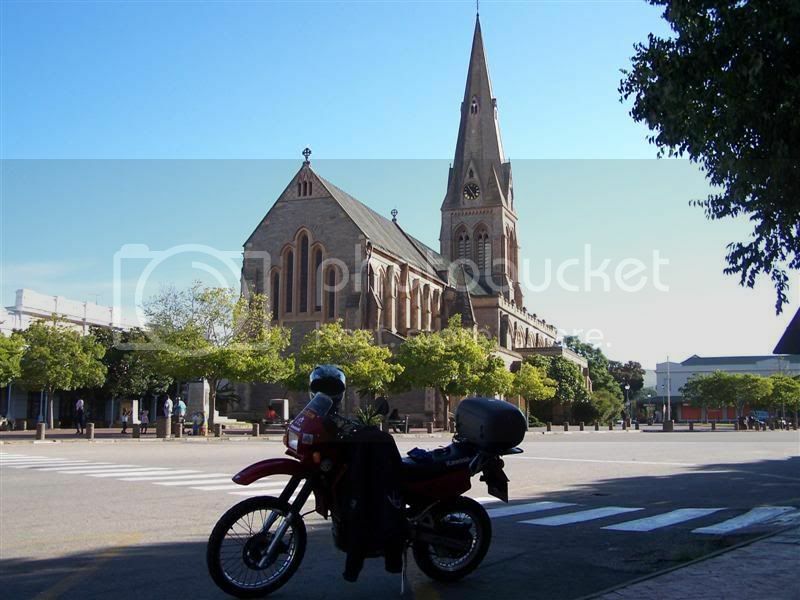 During our firts d/s ride near 4 years ago we just started taking pics of our bike in front of churches, because as you said - you'll find the most amazing churches in rural SA. I would guess we have more that 100 pics of different churches between wino and myself. What do you think w - a project like the passes or as is? Some very nice photos you've got here wino. These old church buildings are fascinating. I'm looking forward to the church project. Heidelberg GP also has a very beautiful church. I still want to go there myself to get a pic or two. What would be lekker if a short history was included - eg: year built, cost, time etc and some defining moments. 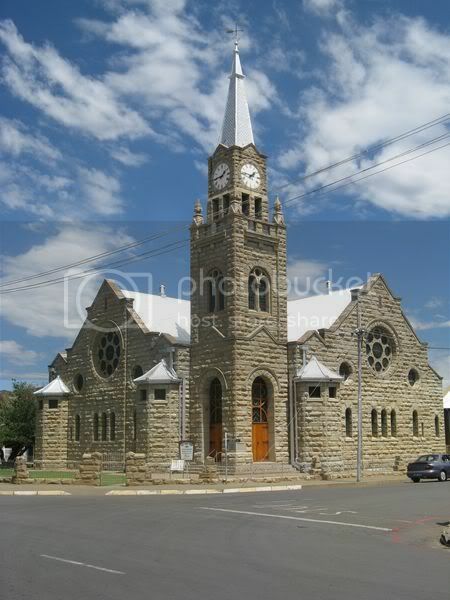 The first church that comes to mind is the Dutch Reformed Church in Graaf-Reinet. Very beatiful and impressive building. Here is a pic taken by my daughter in Dec 2007 in Riversdale.Sorry no info on the Church. "It's not the size of the dog in the fight,it's the size of the fight in the dog"
Hey Operator, same Church we saw yesterday on the way back. You could keep yourselves busy & interested for ages on that project. I will post a list of reference books tomorrow - my vrou is 'into' old buildings & has an extensive library. Tony don't you think that church is just the most beautiful church in R S of A ? Well in my books anyway? The "platteland" always have the nicest churches! Wino those pics are brilliant!! This is a very nice tread, with awesome photos. I am always fascinated with the architecture. The material used; rock, stone, wood. .... and them bells!! some with the most beautiful sound. At the feast of ego everyone leaves hungry. Not sure if this qulifies as a church. In the gardens of the Marianhill Monestary in KZN. Peeked through the window - Inside it has an altar and just two pews - room for about six people. The crash helmet in the foreground qualify it as a "biking" subject?